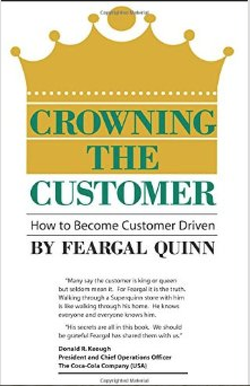 Feargal Quinn has had a career in both business and public service. He is the founder of Superquinn supermarket chain, of which he remained non-executive president for some years after his family sold out their interest in August 2005. Superquinn was known for its dedication to customer service and having pioneered a number of innovations, including Ireland's first supermarket loyalty card in 1993, SuperClub. It also introduced self-scanning of goods by customers in a number of its outlets (Reward Card SuperScan). He became the chairman of the Interim Board for Posts and served as chairman of its successor An Post (the Irish postal administration) until 1989 – he also served on several other public authorities and boards. From 1993 to 1998, he chaired the steering committee which oversaw the development of the Leaving Certificate Applied. In 2006 he was appointed an Adjunct Professor in Marketing at National University of Ireland, Galway. He is currently chairman of Springboard Ireland. He is a former President of EuroCommerce, the Brussel-based organization which represents the retail, wholesale and international trade sectors in Europe. Its membership includes over 100 commerce federations in 27 European countries, European and national associations representing specific branches of commerce and many companies. Also he served on the board of directors of CIES – the Food Business Forum based in Paris as well as the American-based Food Marketing Institute.